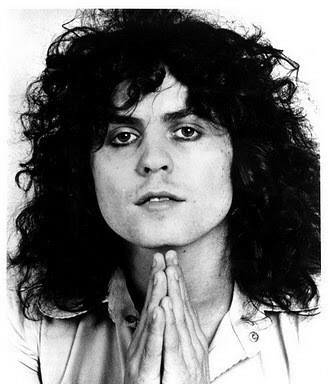 I have been a Marc Bolan / T.Rex fan since the early 1980’s. I discovered the wonders of Marc’s wonderful music and poetry in a very strange way: I was a huge AC/DC fan at the time and was in the habit of acquiring every magazine with the slightest mention of AC/DC in it. One day I was reading an issue of Cream Magazine and came across a blurb stating that anyone who enjoyed AC/DC (in particular Bon Scott – my fav!) would probably like listening to T.Rex also. I hopped on the bus and headed to my favorite record store, Sound Odyssey, which was located on Frankford Avenue in Philly. The only T.Rex album they had at the time was The Slider and I bought it and brought it home. I stuck the record on my turntable expecting the loud, raunchy rock of AC/DC to hit me. It was nothing of the sort. It was unlike anything I had ever heard before and I was immediately hooked. I still don’t have any idea why Cream magazine would liken T.Rex to AC/DC, but I’m glad they did or I might never have had the fortune of discovering what immediately became my favorite music. I soon discovered another record store in Philadelphia that was to become my favorite place: The Record Cellar on Bustleton Avenue. I squirreled away my earnings from working at Dunkin Donuts and became a regular visitor at this awesome used record store. I went on to purchase every single album ever put out by T.Rex, their earlier incarnation of Tyrannosaurus Rex, and Marc Bolan. Because of Marc’s love of a certain book called The Lord of The Rings, which I had not heard of previously, I was soon introduced to a world of magical Elves, Dwarves, Hobbits and other creatures and became a regular visitor to Middle Earth. I can’t thank Marc enough for his music, poetry and personality and the influence he has had on my life both musically and spiritually. This section of my website is my very small way of paying tribute to him and his creations. Love him! Always have, since 14 now 59 yr old female!!! So sad for his family, son, June and mom, dad and brother. The loss of a lived one is hard! I’m still sad too. I went to Marc’s resting place in August and had a tear or two. P.s. Any chance of “Seagull Woman”? Thanks ever so much for all the work put into this listing of Marc’s stuff. So many of those older ones are personal favorites, and I never took the time to try and transcribe them myself. Finding this was epic for me, as I’ve played guitar and sung, intermittently, since I was a kid (around the Telegram Sam time). I totally agree with Adam (above), what a wonderful tribute to Marc. Again, thanks. Do you do requests? ….. Summer Deep is absolutely amazing. I will try to come up with something! I have just posted chords and tab for Summer Deep! Many thanks Maria for your lovely Homage! Great job, Mary. Your dedication is something to be admired and something we are most grateful for – thank you!